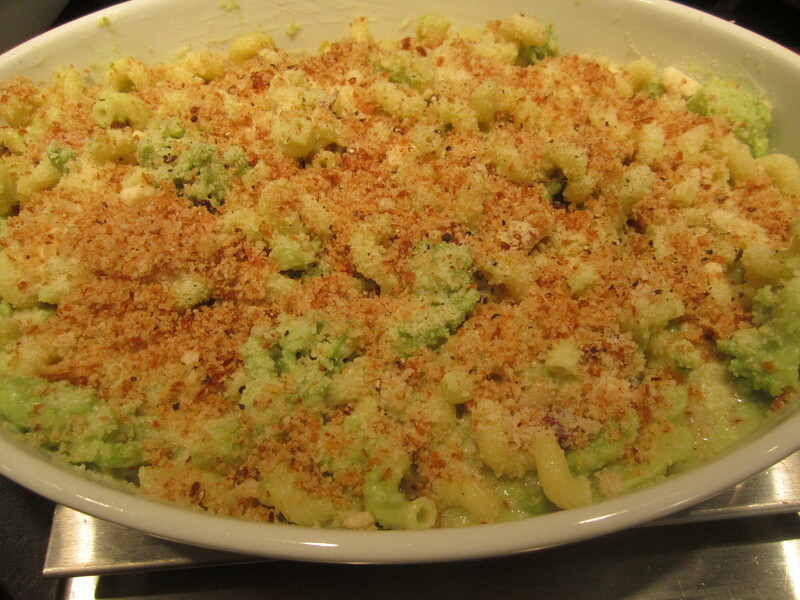 I love the idea of baked pasta dishes–especially when the weather turns cooler. We might call it macaroni and cheese in this country, but in Italy every region has its own local version of pasta al forno. I’m always looking for interesting ways to do baked pasta apart from the usual leaden bechamel and multi-cheese versions that most people associate with the dish (not that there’s anything wrong with that!). 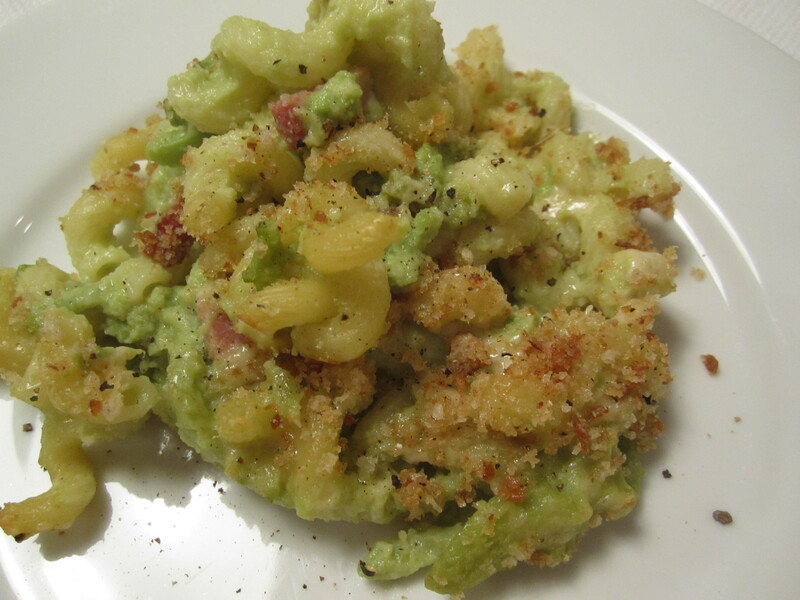 This version is a spinoff of my recipe for cavatelli with creamy broccoli. The sauce is actually a puree of vegetables (with a little bacon for deep, smokey flavor). I’ve added just a tablespoon each of of flour and butter to add body to the sauce, but no cream or milk. To thin the sauce, I used a good amount of the well-salted vegetable cooking water. I’ve opted for romanesco broccoli, since my market has continued to grow it into the fall–it’s the perfect combination of starchy and green. 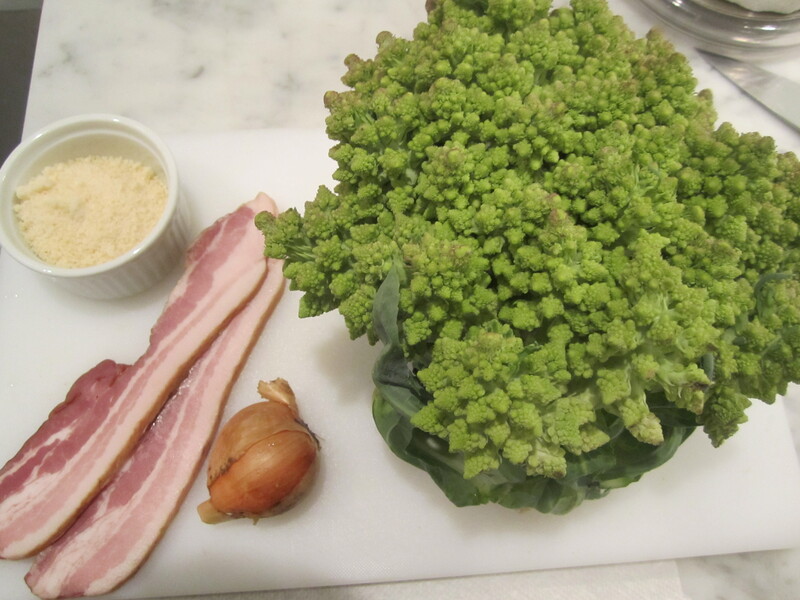 Admittedly, romanesco is difficult to find, so as a substitute, I would recommend cauliflower or broccoli, or a combination of the two. Caulflower is the closest thing to romanesco, with the same ratio of thick, edible stems to florets. 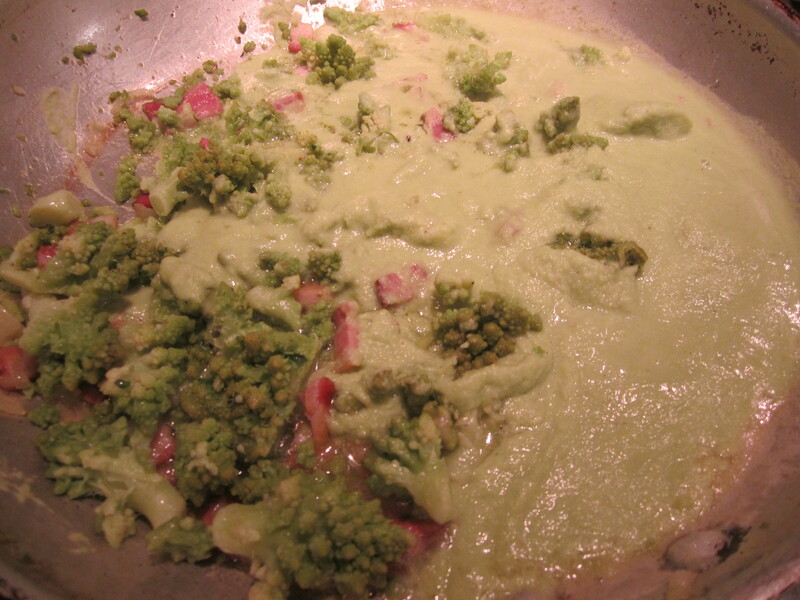 After the broccoli have been blanched and sauteed with bacon and shallots, part of the mixture is pureed, while leaving some of it whole. 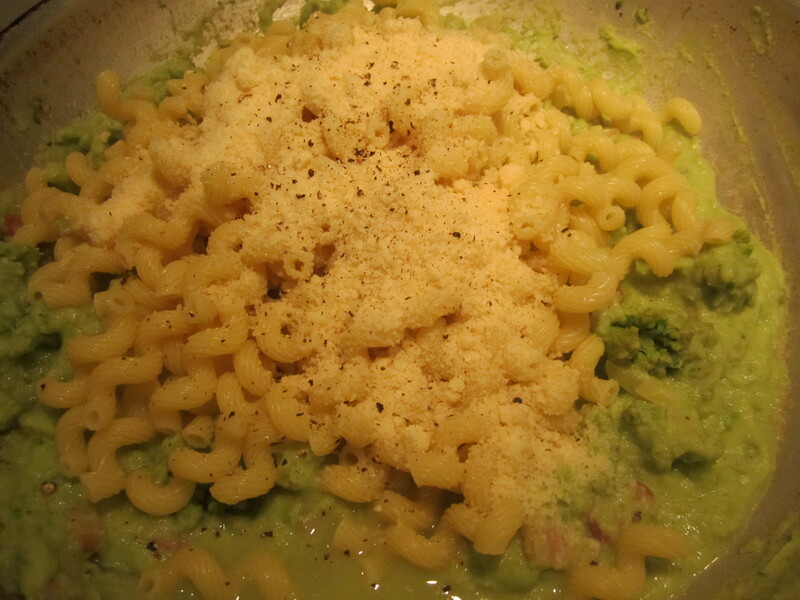 The partially cooked pasta is added to the skillet containing the sauce, then the whole mixture is folded into a baking dish and scattered with toasted breadcrumbs (for the breadcrumb recipe, see my romanesco broccoli with toasted breadcrumbs, although any plain toasted bread crumbs will do), along with a generous half-cup of grated parmigiano cheese. The dish gets baked at 400 degrees until toasty and bubbling. 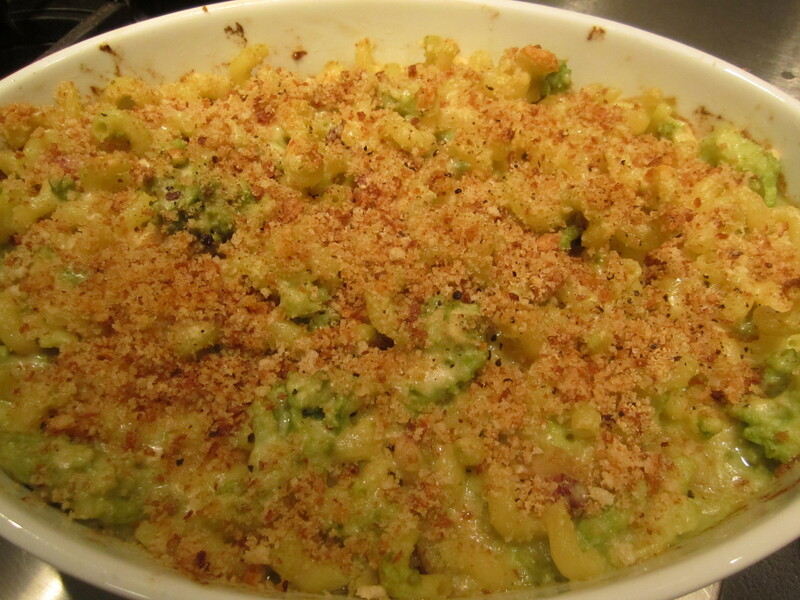 You will love the lightness of this dish compared with traditional baked pasta. I promise you this dish will make a vegetable eater out of just about anyone! Like most baked pasta dishes, this is substantial enough to be the main course. 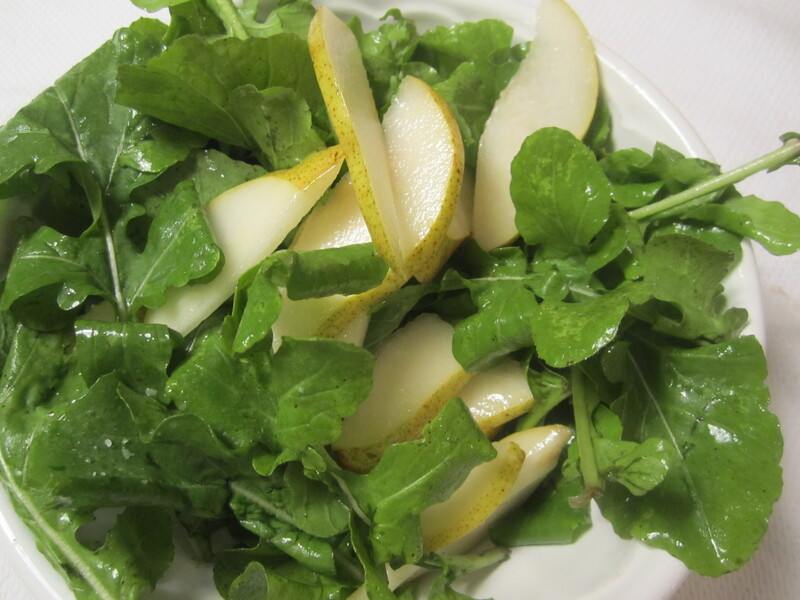 Tonight, the only thing necessary to round out this meal was a refreshing salad of local arugula and pears, dressed with olive oil and lemon–the perfect raw, crunchy/sweet palette cleanser, served after the pasta. Cut broccoli into bite-size pieces and drop into well-salted boiling water (I mean well-salted–like ocean water–you’re going to use quite a bit of this water for the sauce). Boil for about 6 – 8 minutes or until crisp-tender. Drain and set aside. 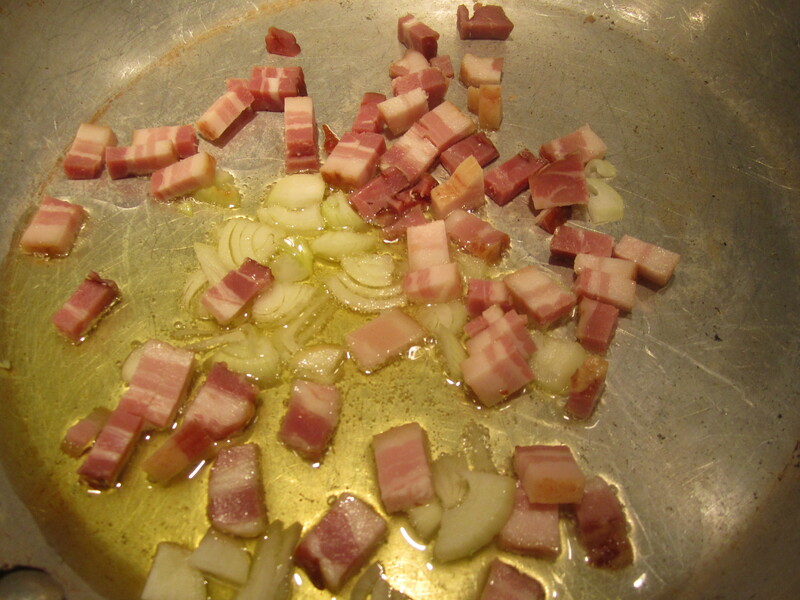 In a large skillet on low heat, place bacon and shallots. Cook on low until bacon has begun to render and shallots have begun to turn golden. 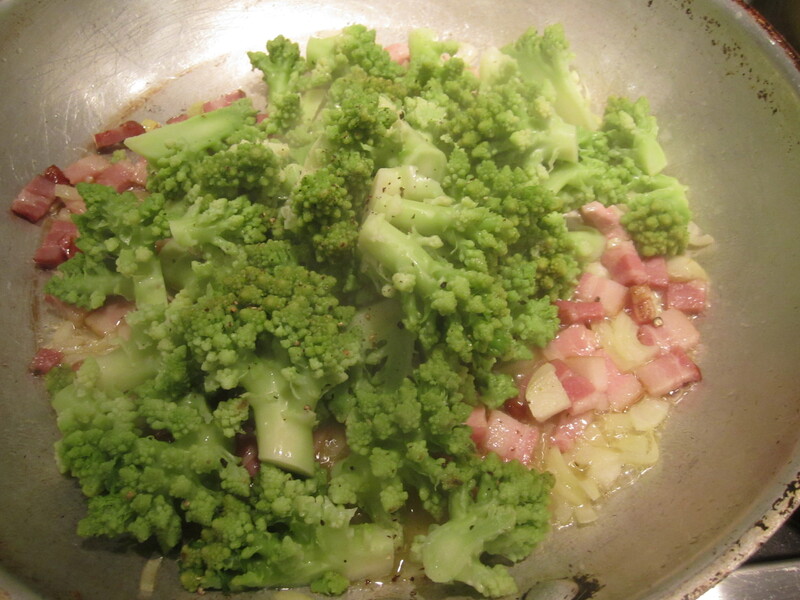 Add broccoli to the skillet and saute for about 3 – 4 minutes on medium heat. Drop pasta into the boiling salted water from the broccoli and cook until a couple minutes shy of done (it should still be quite al-dente). 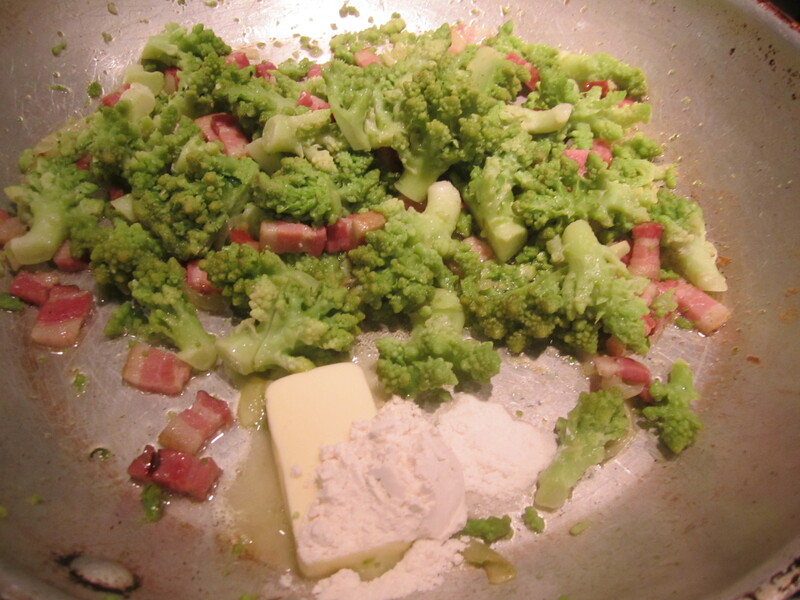 Remove about two-thirds of the broccoli, shallot and bacon mixture from the skillet and place in a blender, along with 1 1/2 cups pasta cooking liquid and the nutmeg. Puree until smooth, adding more pasta water if necessary to get it to a saucy consistency (this will vary depending on how watery your vegetables are). I ended up using about 2 1/2 cups pasta water to make my sauce. In the skillet with the remaining vegetable mixture, add the butter and flour and stir to incorporate flour–it will disappear and any remaining liquid in the skillet will tighten up. Add back the pureed sauce to the skillet and stir, adding more water if the sauce is too thick. Add the cooked pasta, along with 1/2 cup grated cheese to the sauce and vegetables gently stir to combine. Pour the contents of the skillet into a buttered baking dish and sprinkle with the remaining cheese, toasted breadcrumbs and black pepper. Bake at 400 degrees for about a half-hour, or until toasty and bubbling. This entry was posted in Pasta. Bookmark the permalink.